Adjustability for increased personal comfort and productivity. Includes tool for quick and easy assembly. Monitor and keyboard shelves adjust in 5" range, 29" to 34" high. Pullout printer shelf adjusts in 1" increments. 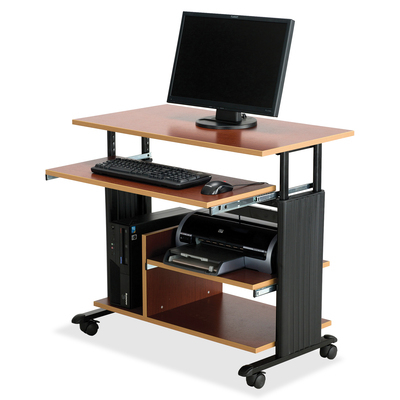 Accommodates CPUs up to 16" high. Adjustability for increased personal comfort and productivity. Safety cap with cable management side covers. Includes tool for quick and easy assembly. Monitor and keyboard shelves adjust in 5" range, 29" to 34" high. Pullout printer shelf adjusts in 1" increments. Accommodates up to a 16" high CPU.